Whatever model of industrial Avon you operate, we can support it. Our capability and experience extends across the full range of industrial Avon gas generators, from the earliest Mk 1533 and 1534, right through to the current Mk 1535, as well as the latest generation Avon 200 engines. For more than 26 years, the global power generation and oil & gas industries have benefitted from our expertise. 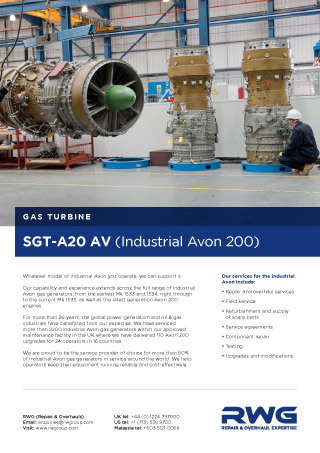 We have serviced more than 2200 industrial Avon gas generators within our approved maintenance facility in the UK where we have delivered 110 Avon 200 upgrades for 24 operators in 16 countries. We are proud to be the service provider of choice for more than 60% of industrial Avon gas generators in service around the world. We help operators keep their equipment running reliably and cost-effectively. With a dedicated industrial Avon team of more than 50 highly experienced people, you know your equipment is in safe hands at RWG. Our product knowledge and technical expertise is unrivalled in the industry. We have the capacity to support up to 60 engines each year. Our services are OEM approved. And our workshops are equipped with specialist tooling and the latest technologies. Whatever your requirement, you can trust us to help lower the cost of ownership of your equipment. The industrial aero-derivative Avon gas generator entered the market in the 1960s, and there are more than 700 in service today. With a reputation for reliability and resilience, the industrial Avon is widely used in power plants, oil refineries and offshore installations around the world. Measuring around three metres in length and weighing in at over one metric tonne, an industrial Avon produces approximately 15 megawatts of power. The latest generation industrial Avon 200 was introduced in 2007, bringing improved power output, efficiency, and environmental performance. We are here to support you whenever and wherever you need us. We can meet all of your maintenance, repair, overhaul and performance testing requirements within our state of the art, dedicated industrial Avon gas generator facility in the UK. You’ll benefit from our technologically innovative component repair solutions, designed to enhance the service life of your gas generator parts. And when it comes to spare parts, inventory management, exchange engines and field service, we can deliver. We provide an advance exchange option for operators who don’t have the luxury of time or rotable assets within their fleet. Typically, this service requires assembly and configuration of an exchange gas generator in advance of a planned maintenance event. 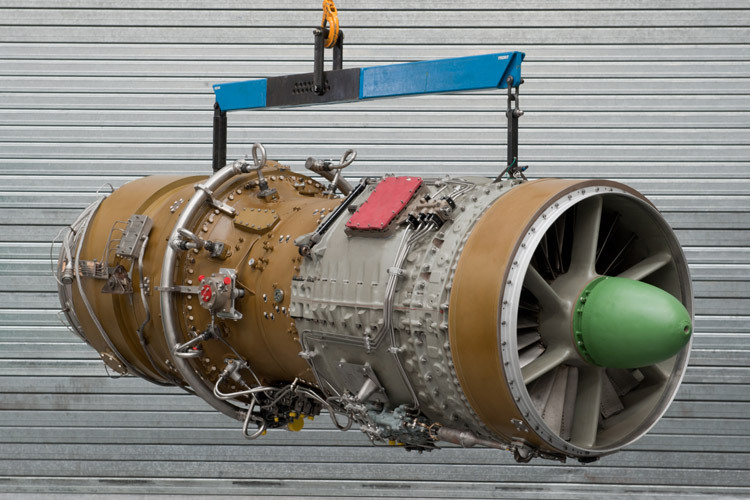 We’ll ship the replacement engine to you ready for immediate exchange and matched to your site specific configuration. Our service option can include installation and commissioning to minimise plant downtime and let you resume business operations with minimal disruption. Get in touch with us to discuss your industrial Avon gas generator service requirements. Supporting power generation in Finland. Enhancing oil production in Abu Dhabi. New generation of gas generator container.